Bartenders are the ultimate givers of both verbal and liquid empathy, but if you haven't been behind the bar yourself, it can be hard to understand that the job is more than being a professional bottle lifter. 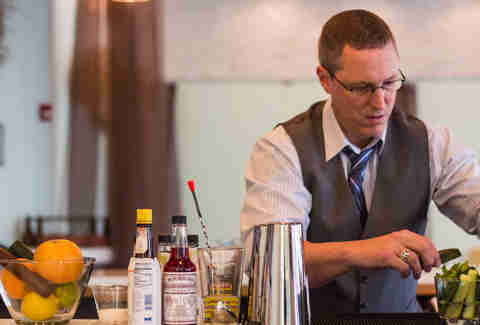 So, to clear up some misconceptions about the wide world of bartending, we chatted with a few anonymous industry pros about the aspects of their jobs that are the least understood. Keep these ideas in mind next time you step up to the bar, and your bartender will be much happier to enable your partying. On average, bartenders probably do 10-12hr shifts, sometimes with no break. There are hours of prep work, hours of clean-up, and hours of catering to the demands of people who have no concept of a bartender's actual hours. The bartender is like the parent at a slumber party: they are working to make sure everybody else is having fun, while trying to keep them from getting in too much trouble. And once the kids go to bed, they're up late cleaning the mess. 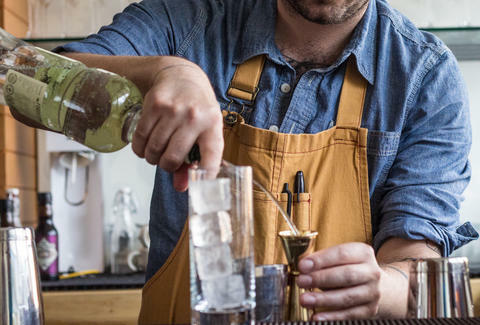 A skilled bartender always wants to make the best drink possible, but in a busy bar there's a balance between meticulous craftsmanship and breakneck efficiency. This is particularly true of inexperienced bartenders who don't have their recipes memorized. If they're slammed with Negroni, Manhattan, and Old Fashioned orders back-to-back, they're immediately in the weeds and will be much less excited to discuss the intricacies of their tiki menu. Bartenders do everything at once. A home-cocktail-enthusiast might be able to make a good Manhattan, but it's an entirely different thing to make three at once while taking a beer order, running a credit card, and being eye-pulled by 10 strangers. Most decent bartenders can multi-task like maniacs, good ones can do it while keeping their drinks to a high standard, and only the best can pull it off while maintaining a hospitable smile. You're not paying a bartender for their time, you're paying them for a way to waste yours. So advice from a bartender seems to come with the same air of authority as a professional counselor, but without the baggage of a ticking clock. You might run into a gruff bartender who doesn't want to chat, but most are pretty outgoing people. They wouldn't be in this industry if they didn't like talking to strangers. Strangers who tip them well. They want to make it easy on the other bartenders by just getting a beer and a shot, and not bogging someone down by making a 10-ingredient tiki drink. 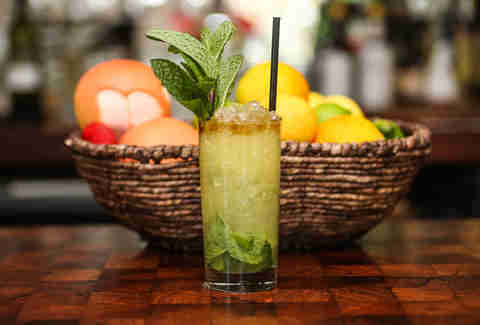 But if the night is slow, a bartender will usually try to order a drink that's indicative of the establishment. And always with a glass of ice water. They don't expect you to order like you're in the industry, but would appreciate it if you did. Some bars don't allow it. Some bartenders don't care about that rule. 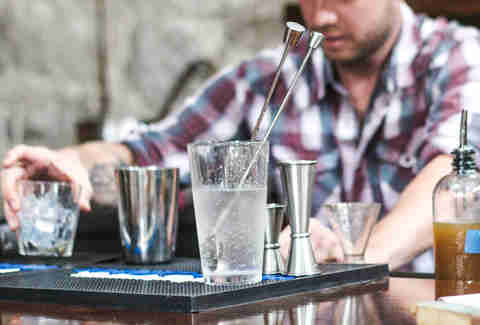 It's not uncommon for a bartender to do a few shots during a shift to take the edge off and as hospitality lubrication. But many have a general policy of not drinking with customers, and will go so far as to pour water in their own shot glass instead of vodka to maintain the illusion that they are fun party dudes. Tipping well is the number one way to get a bartender on your side, but an experienced barkeep can usually tell when you're trying to buy their friendship. That won't fly. Also, a good tip isn't always just cash; it can be a good attitude, a bit of well-timed banter, or just the ability to read the wavelength of the bartender and act accordingly. Ordering a bartender's signature cocktail might earn you a slight nod of approval, but usually your barkeep is much happier to make you something you're not going to regret spending eight bucks on. If you're looking for drink advice, give a few hints as to what you enjoy or ask what the bartender would be drinking if they were on the other side of the bar. Odds are they are also professional drinkers. Ok, well, some do. But the reality is that most women aren't patient enough to wait until 4:30am for their bartender-crush to close up shop, return home, down a pair of cheap beers, and catch up on their /r/cocktails Reddit feed. Dan Gentile is a staff writer on Thrillist's national food and drink team. He has recently added "beer and a shot" to his ordering repertoire and is looking forward to many approving nods and confusing buzzes. Follow him to happy bartenders at @Dannosphere.